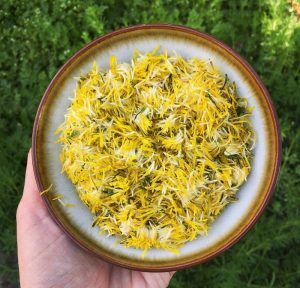 Dandelions, like many other “weeds,” are among the most nutritious and medicinal foods on the planet. 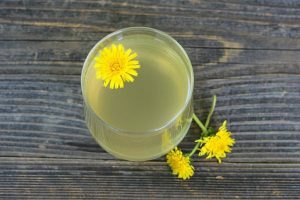 They’re also one of the most delicious when fermented with honey into this health-promoting elixir. Also known as “honey-wine,” it’s made simply by adding water and yeast to honey, along with any other fruit flavorings and spices you like. Perhaps the first fermented beverage on the planet, mead has been revered for its medicinal properties for thousands of years. Ancient Greeks called it “the nectar of the gods,” believing it promoted virility. The Anglo-Saxons thought it inspired creativity. Viking warriors who reached Valhalla were supposedly rewarded with mead by beautiful maidens. According to legend, Odin, the Norse god of healing and battle, gained his strength by drinking mead as a baby. A 2014 study bolsters the ancient superstitions, finding the lactic acid bacteria in mead made of raw honey is highly effective at fighting off antibiotic-resistant bacteria, including MRSA. Raw honey also contains pollen, which has more proteins than meat. Mead originated in Africa more than 20,000 years ago. It was most likely discovered by accident, and it all started with honeybees. During the rainy season, their nests would fill with water. Airborne yeast helped ferment the watery honey and the first mead was created and enjoyed by African bushmen. In time, mead making became popular throughout Europe, India, and China. As people moved into cities, where honey was available only to royalty, mead-making became a lost art, preserved only in the monasteries of Europe. Today, the ancient beverage is regaining popularity. STEP 1: Go pick dandelions. You’ll need about 3 quarts of flower heads. If you don’t have enough in your yard, consider asking your neighbor if you can pull their “weeds” for them 😉 Just make sure they haven’t been sprayed with herbicide. April and May are the best months to harvest dandelions. STEP 2: Rinse and then separate the yellow petals from the green heads. The green parts of the flowers will make the mead bitter. You’ll need about 3 cups of petals. STEP 3: Boil 1 gal of water in a large pot. Add one quart to a mason jar with the petals, and put in the refrigerator to steep for 1 day. STEP 4: Remove the rest of the water from heat, wait until it cools to less than 120 degrees. Add raw honey. Stir untilf honey is fully dissolved. STEP 5: Add the must, raisins, and yeast nutrient to a sanitized 2-gallon glass fermenter. STEP 6: Seal fermentor with airlock lid and store for a day, until the must cools to about 70 degrees. STEP 7: After a day of steeping, strain petals from the dandelion tea and add to fermentor. STEP 8: Add the juice and zest of one lemon. STEP 9: Aerate the liquid in the fermentor, and add the rehydrated yeast. STEP 10: Put the fermentor in a dark place at a temperature of around 70 degrees. STEP 11: After 2 weeks, with a siphon, re-rack the mead into a sanitized 1 gallon carboy. STEP 12: After 4 weeks, re-rack, then let age for 6 months. STEP 13: Fill sanitized bottles and let age for at least 5 more months. STEP 14: Drink with friends after the last snow melts to celebrate the beginning of spring!